We would gladly create this fox fur blanket in any custom size you'd like. Please note, however, that this would lengthen the time of delivery ca. 2-3 weeks.A fox fur blanket made of soft, luxurious SAGA furs is the perfect way to distinguish your home decor! The furs in this item come from the Scandinavian fur producer SAGA, one of the most well-respected fur producers in the world. These furs also come with the Origin Assured industry designation, which ensures that they are of the highest quality and come from humanely treated animals. Like all of our products, this fox blanket is handmade by our team of expert furriers and tailors at our workshop in Kiel, Germany. At Master Furrier, we use only the finest furs and materials to create products of unparalleled quality. This blanket comes with a SAGA certificate for the origin and quality of the furs. The golden island fox (alopex lagopus forma domestica) belongs to the farmed foxes from Scandinavia. A reddish-orange color characterizes the golden island foxes. The golden island fox has a darker back and lighter colored belly. The hair of the golden island fox is medium-long, very silky, full and soft. Responsible handling of the natural product fur is one of our primary concerns. For this reason, we only purchase our golden island fox skins directly from fur auctions such as SAGA Furs in Finland and the Copenhagen Fur auction in Denmark. If you decide to purchase a product from Scandinavian golden island fox, you can be sure to receive a superior natural product from excellent Scandinavian farmed foxes. 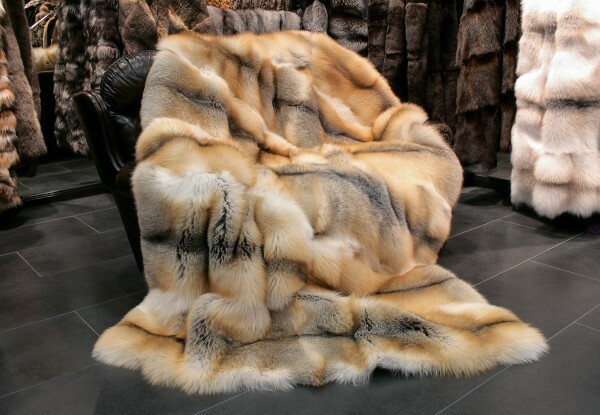 We produce golden Island fox fur blankets, fur cushions, and accessories. If you have any questions regarding our golden island fox fur blankets, please do not hesitate to contact us. Related links to "Golden island fox fur blanket - SAGA quality"
Customer reviews for "Golden island fox fur blanket - SAGA quality"
I just got home and the fox came today!!! It is absolutely perfect in every way....very elegant! I especially was thrilled with all your details, lining, stitches and your lovely label.